ASA ABLOY HS8010P & ASSA ABLOY HS8020P high speed doors are designed for exterior and interior openings in medium sized heavy duty operations. The ASSA ABLOY HS series doors feature a flexible door curtain for maximum safety, tight seals for protection against humidity, dust, and dirt. The high speed doors are improved for traffic flow and a unique direct drive system for smooth, consistent operation. The ASSA ABLOY HS8020P high speed doors provide superior protection and improved efficiency for personal and equipment. 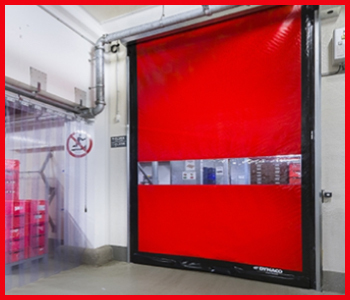 The flexible door curtain is designed without rigid components and features a soft bottom edge that yields when contacted, eliminates damage to products and protecting workers from injury. Fast openings speed up to 96 inches per second also ensure efficient operations in high traffic environments. When closed, the ASSA ABLOY HS8010P & ASSA ABLOY HS8020P seal tightly, maintaining interior temperatures, minimizing energy loss and keeping out dust, dirt, and humidity. The patented, UHMW plastic side guides firmly grip the innovative zipper component that runs along the edge of the door panel, preventing the air leakage and maintaining pleasant indoor conditions. When a high speed door faces demanding conditions, accidental collisions are almost inevitable. The ASSA ABLOY HS8010P & ASSA ABLOY HS8020P have been designed to withstand accidental impact and can be easily reset for continued operation. When hit, the door curtain breaks away with no damage or incident and resets automatically into the side guides. This reliable resetting feature eliminates downtime, keeping people and the business moving efficiently. Door curtain: Blue 27 ounces/yards 2 PVC curtain standard. Wind resistance: HS8010P – up to 95 mph. HS8020P – up to 110 mph.